Every ingredient used to craft this refreshing beer has travelled 24 miles or less from farm to brew kettle. First, water from the Sooke reservoir is blended with barley, grown and malted locally by Mike Doehnel. Then we added a pile of Cascade hops from Vic Davies Saanich farm and fresh blueberries from Farmer Phil. All this deliciousness was activated by Yeast Wrangler Ben’s unique house-strain of ale yeast and you are off to the flavour races. You might want a bib for this one, as there is a certain shirt-staining potential from all those berries. 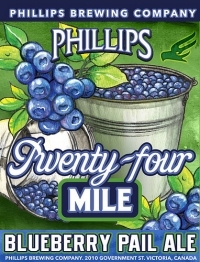 In keeping with the local theme, Twenty-Four Mile Blueberry Pail Ale is available only a select beer stores in Victoria, as well as at the brewery. Sold out the very next day!